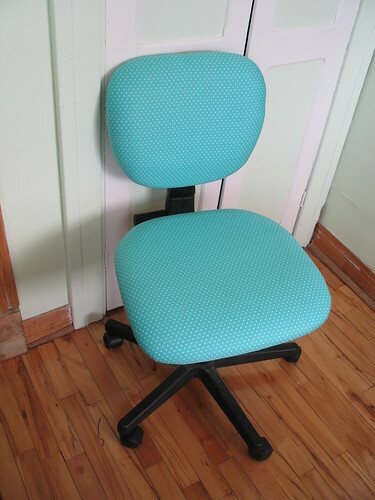 I mentioned that I salvaged the fabric that I'd covered my desk chair in and used some of it in a new project. And here's the "ta da" post! 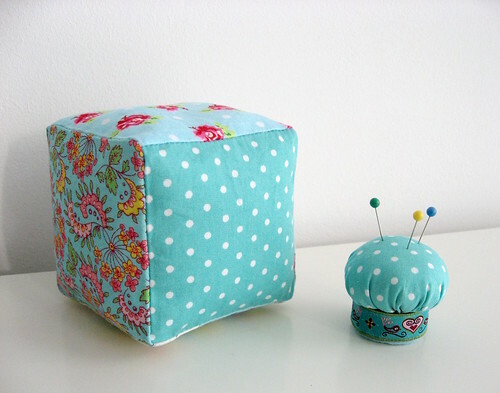 I used a piece for one side of my turquoise fabric cube and another little piece in making a tiny pin cushion. And there's still plenty leftover. 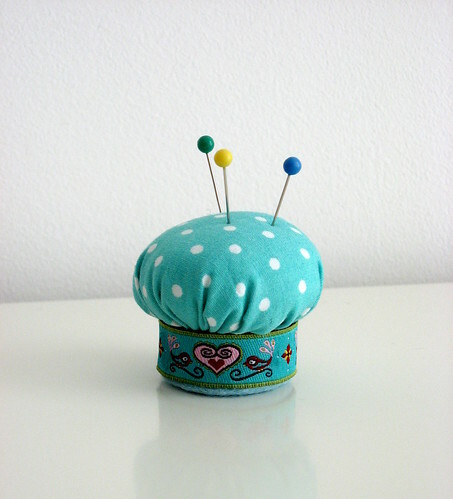 I'd had the pin cushion tutorial bookmarked for ages, but I never had any stuffing on hand before, so I never made one. It was pretty instant gratification aside from the fact that I used regular craft glue since I don't have a hot glue gun. The glue did sort of soak through the trim in a couple places, so I'd probably try to use a minimal amount if I did it again. I'm not sure whether or not this is an issue with the hot glue. I do love its adorable mushroom shape and it's been useful already since I'm on a bit of a sewing spree lately. 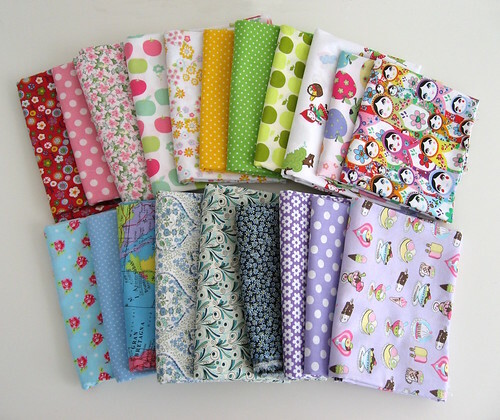 I tend to buy fabric I love when I see it, but because I don't want to be spendthrift, usually only a quarter to half a metre at a time (unless I have a specific project in mind). 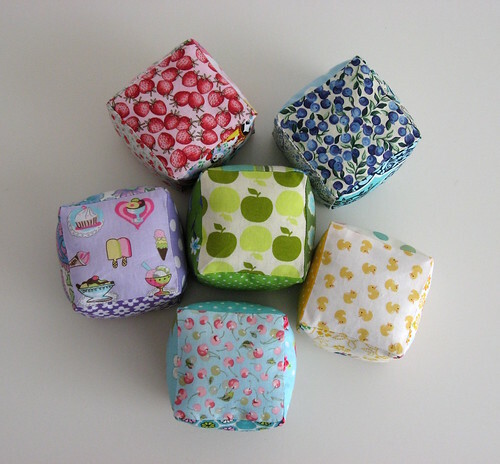 Thus, I have a stash of many small bits of fabric. 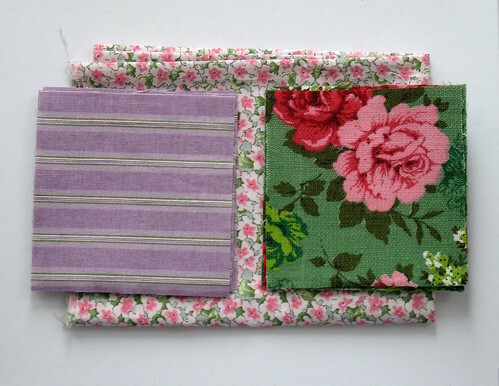 It's perfect for things like a patchwork quilt, pillow or bunting. 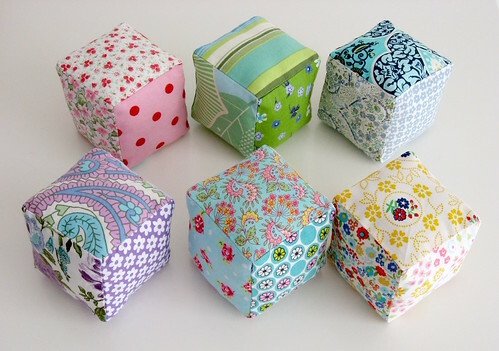 It's also great for fun fabric cubes. 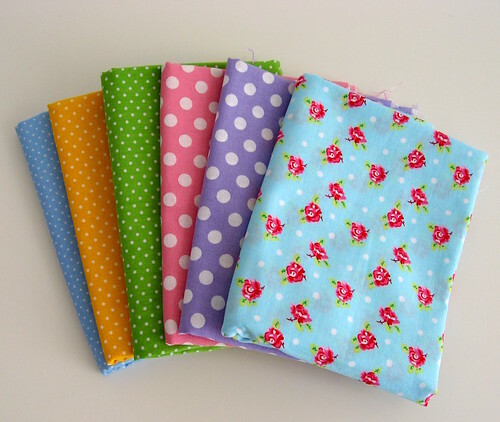 When I bought my sewing machine, I immediately indulged in a little fabric, but typically, I mostly bought more blue fabrics. 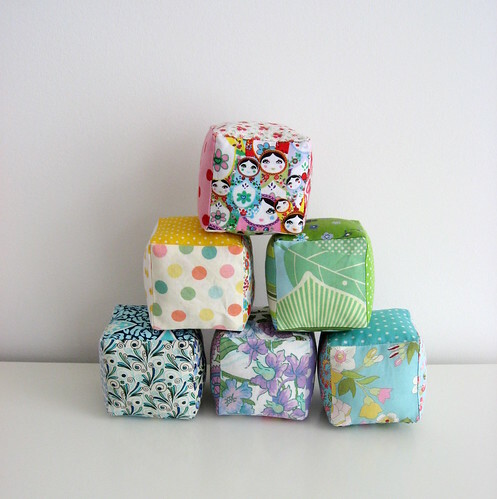 My stash was skimpy for, well, pretty much everything but blue and I wanted to make cubes of different colours. I used mostly stuff in my stash, but I also bought a few more new bits at the Albert Cuyp Market and the Lapjesmarkt. 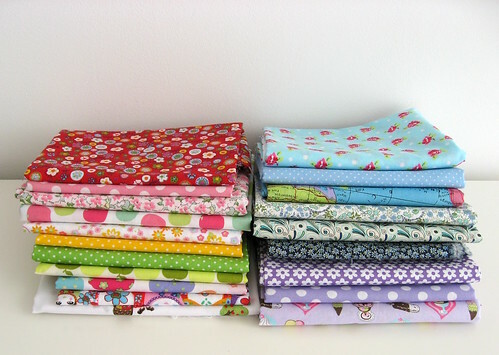 The Quiltlapjes stall that I usually frequent at the Albert Cuyp market was mysteriously missing that Friday, so instead, I shopped at De Boerenbonthal, a fabric store opposite Jan, the notions store. They had a big selection of polkadot fabrics in one of the side rooms. 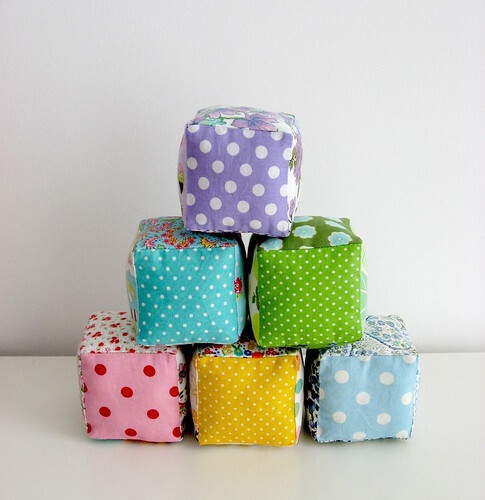 I love how prevalent dots are in the Netherlands as a pattern (on fabric, but also housewares). They did also have some flannel (which I was looking for the other day), but a grand total of just five patterns and none that I found the least bit compelling. 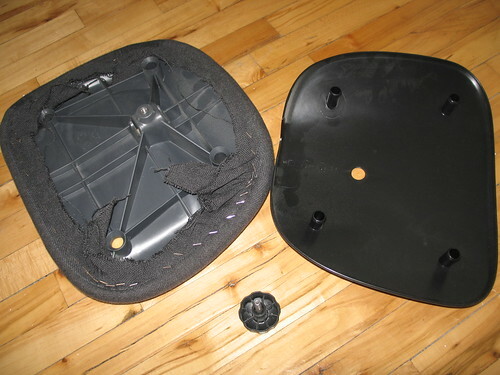 The IKEA Stefano chair is an affordable desk chair, but "cute" it is not. 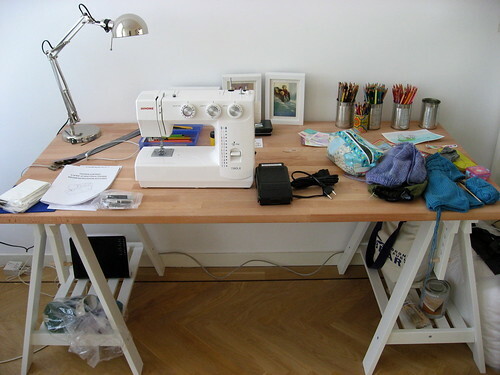 Here's how to reupholster it with fabric that appeals to you. 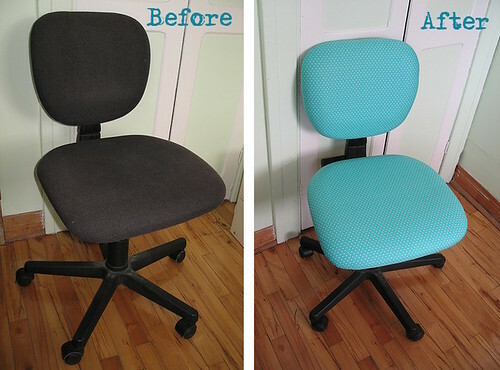 I actually did this chair makeover project nearly 3 years ago now, but I only shared it as a "photo tutorial", and I find tutorials are easier to follow in the format of a blog post. For obvious reasons, this IKEA chair didn't make the cut of things to either ship or store when we moved overseas, but I did remove the fabric to reuse later (coming soon on a new project!). 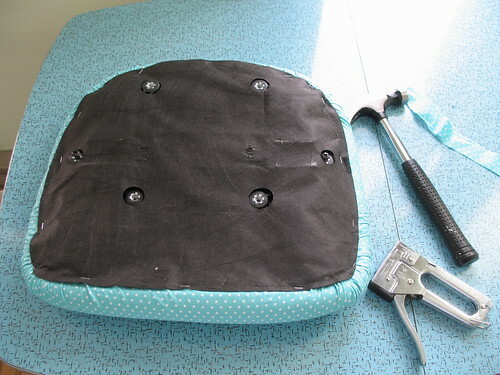 Your fabric will have some holes in it obviously, but if necessary (like, say, you want to sell the chair, but not your fabric), you can remove your fun fabric and the chair is still usable, with its original covering. 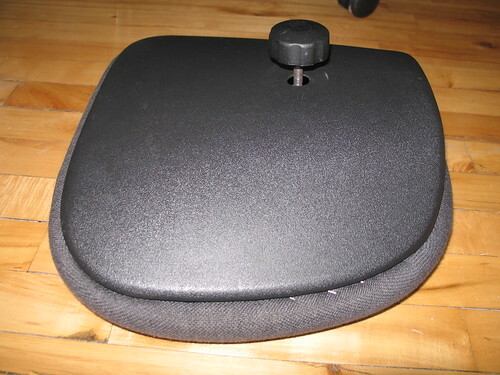 Unscrew the knob until you can slide the chair back up and off the chair. Unscrew the knob completely then pry the plastic back off. I found it easier to pry the top out first, but it was still quite a lot of yarding on it to get it to pop off. 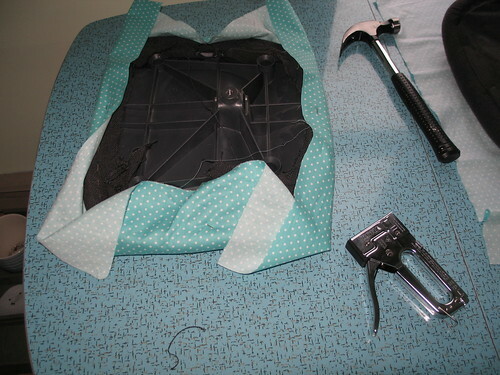 Unscrew the chair seat too, then lay out the pieces on your fabric. I had just over half a metre (24 inches) of fabric from a 45 inch wide bolt. 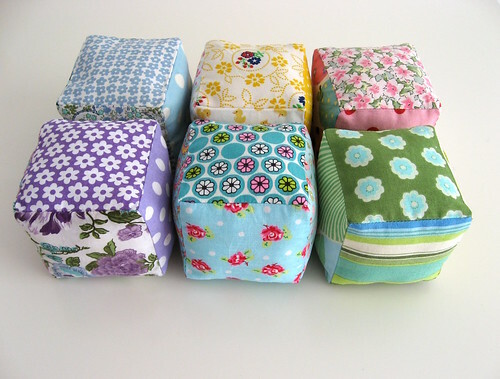 You might need more with some fabric patterns. 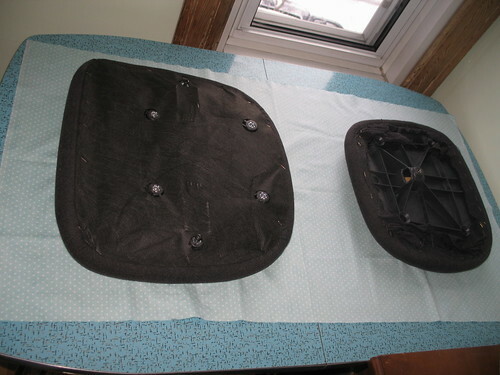 Check that you have enough to pull round before you cut your fabric between the two chair pieces. Starting with the chair back, staple top, bottom, and each side. 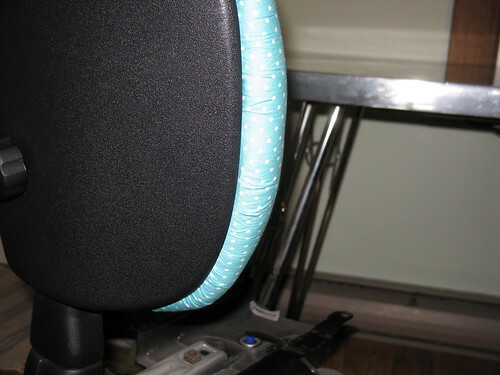 Then gather in the corners and slowly add more staples, working around the chair to keep the tension even from all sides. This is what the front looks like after the first staples. Pull taut on each new staple to end up with a smooth result. This is the worst part... gathering in the corners. I have no good technique other than fiddle about until it looks ok, then staple. And it's a good thing the staples come in packs of 1000 because a lot didn't go in completely and I had to pull them out again with some pliers. 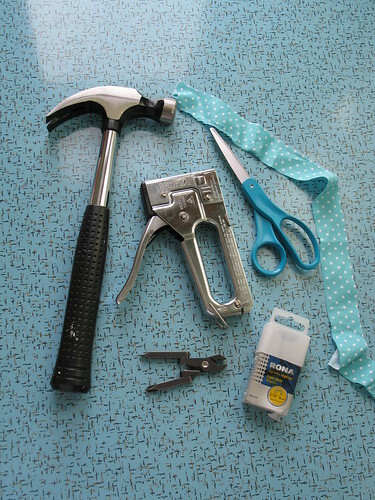 Others I could bash in with a hammer. A heavy duty staple gun probably would have worked better. Here's Stefano with the new chair back. You can see from the back that some of the gathers are visible, but the front is smooth. 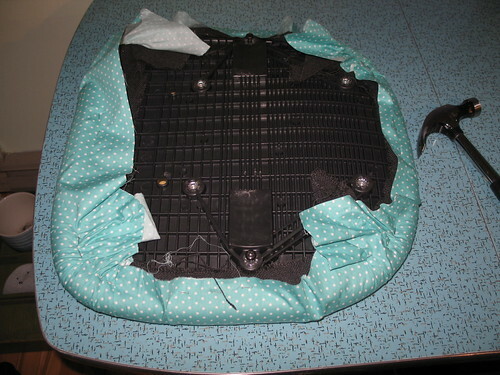 You do the seat in the same manner, except that you first have to pry out the staples in the fabric bit that covers the mess underneath. 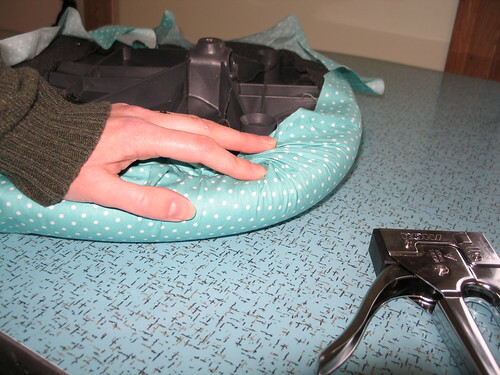 Set aside the cover to staple on again when you're done the bottom. 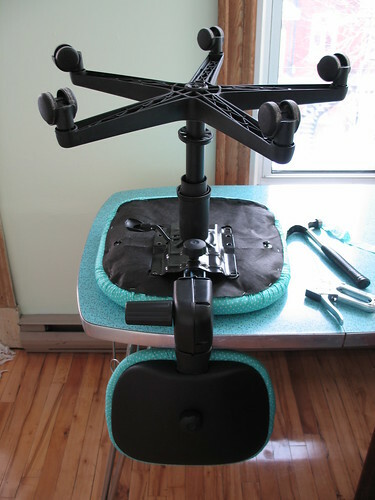 It's easiest to re-attach the seat base by setting everything on a table. It's not perfect, but you hardly notice unless you bend down to look at the edge. 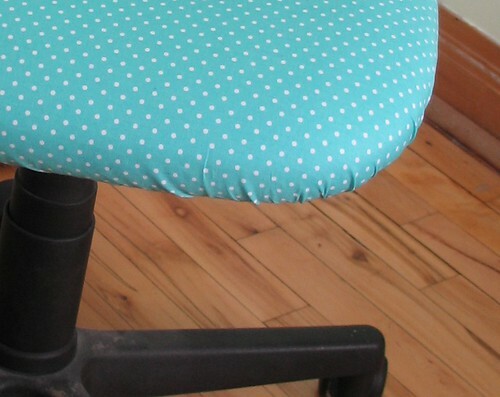 If you re-cover your desk chair following this tutorial, I'd love to see it! Please add your pictures to my flickr group. Some friends of friends are also moving from Canada to the Netherlands, so I wrote up some advice based on things I wish we'd known before and immediately after arriving (and good advice that we received). I wanted to put this advice somewhere permanent and where it might help other expats coming to the Netherlands. The only bit that's not specific to moving here is the Expectations section at the end of this post, which I think probably applies to any expat adventure. Before you leave home, set up with your bank to be able to remotely transfer money to your new account in the Netherlands and/or bring a substantial amount of money with you because it's standard to pay up to about 4 months rent up front (2 months as a deposit you'd get back, 1 month for the first month, plus 1 month worth as an agent fee if you have a housing agent). We ended up having our parents transfer money to our account, then mailing them a cheque on our Canadian accounts to pay them back because the Canadian banks wanted us to go to our branch IN PERSON to do an international transfer. You will almost certainly get a better rate on euros at your new bank here, so have the conversion to euros happen at this end. Cheques/bank drafts are not something you will want people to send you for small amounts of money because all banking is done on the internet here and there's a 20-30 euro fee to process a bank draft. Of course, Canada is the reverse, so there's a $30 fee to transfer money internationally (which is fine if you're just doing a big amount to initially set yourself up over here, but otherwise, annoying). See above for upfront costs. I'm not sure how other cities vary, but in Amsterdam, most apartments available for expats are furnished and available 1-2 months in advance at most. So looking for a place to live farther in advance than that is pointless. Very often, places are advertised available "immediately". Unfurnished places seem to be more expensive than furnished because there are fewer available in the expat market. Marktplaats.nl is the "craigslist" equivalent here and what to look at if you want to try to find a place without a housing agent. All the super cheap housing is part of the Dutch social housing scheme and not accessible to expats (and 10+ years waiting list for the Dutch!). Some good advice we received was to find a nice place for your first place, even if it's a little more expensive because that way if you're homesick or unhappy, at least you're not also stuck in a horrible apartment in a terrible location. It can make a big difference also to the spouse who may not have a job to escape to! You should expect issues with the following circular dependency: You will need an address (and possibly also your BSN - like a SIN or SSN) in order to open a bank account which you need to have in order to rent an apartment which you need to get a BSN (they require an address). We got out of this loop because Damian's company is large and hires a lot of expats, so they have a special arrangement with the government that new hires can temporarily use the company's address. Many companies will NOT be able to provide this option. I think the way out is to get a provisional lease so you get the address part sorted and can get your bank account and BSN, but your company should be able to advise you on this if you don't have the option of using a temporary address. In Amsterdam there is the Expat Center which helps you fill out all your paperwork correctly. Depending on your visa status, you may also need appointments with IND (immigration department) and/or an immigration lawyer. The minute you get here, I advise buying a pre-paid mobile phone so that you have a local phone number (or a local SIM card if you already have a phone that will work on the networks here). You will need to do pre-paid before you have a bank account and address, but Vodafone at least will let you convert to a monthly account with your remaining pre-paid credit once you have sorted out the bank account/address thing. There is an OV chipcard transit pass that you will probably find useful immediately. It's a debit-style transit pass and it's good on ALL public transit in the whole country, including inter-city trains. There is some personalized one that takes weeks to apply for and needs a picture and blah blah blah, but we prefer using the "anonymous" ones that you can buy immediately and then are not tied to a specific person (the only downside being that if you lose it, then you lose whatever money was on it). Buy a used bicycle pretty much right away, regardless of what season you arrive in. Snow and ice rarely stay for more than a week or two at a time. Currently it's 10°C and snow-free and we've been having weather like this for much of January. There is no point to buy a new bike: the good ones are way more expensive and will attract thieves. 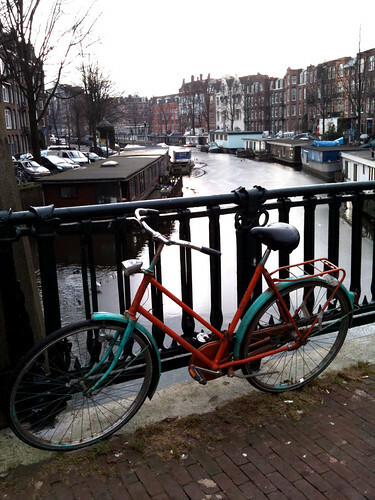 We spent about 100-150 euro each on our bikes, but that's in central Amsterdam, so you might find something good for less. If you see a new bike in this price range, I would not expect it to be very good quality. Get the kind with back-pedal brakes, not hand brakes, and definitely no gears necessary! It's very flat here and you really don't need gears. The back-pedal brakes are what we were advised to get and I think it was good advice. Hand-brakes require more maintenance and the ones here seem worse than the ones in Canada (stiffer, less effective, overall lower quality). They are also prone to having the wires tangled or ripped out on bike racks, because the bikes are packed closely and there's often not sufficient room for the handbrakes to fit over the handlebars of the neighbouring bicycles. Bike theft is a big problem in Amsterdam at least, but you can mostly avoid it if you're careful. Buy a good hefty chain lock, which should cost about 50-60 euro (yes, that's half to a third the price of our bikes!). Just wrap it around under your bike seat when you're riding your bike. Never leave your bike with just the back-wheel lock on (but you'll want one of those too if the bike doesn't already have one installed). We have been very happy living in the Netherlands, but the expat experience is not always easy. Expect it to take 4-6 months to get through the paperwork and feel settled. Arrange to talk to family and friends on Skype or some other video chat. We have found this a great way to not feel quite so far away from loved ones. Before moving here, we received some great advice on attitude from some friends who are living the expat adventure in New Zealand: There will be things you will miss about home and things you don't like about your new location. If you focus on those things, you will be miserable. Instead, focus on all the things that are better and exciting about your new country and you will be happier and have a lot more fun. We've certainly had fun this first year: discovering a new city, learning about a new culture, meeting new people (from all over the world), and travelling to other places in Europe. 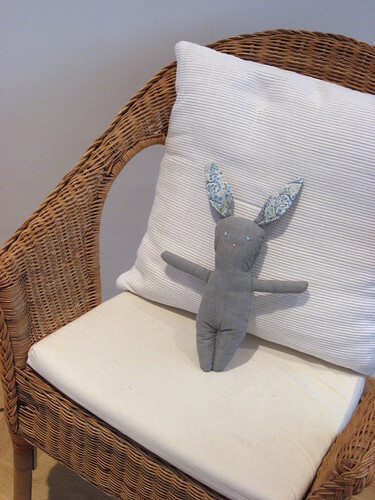 For a while, I've been planning to make a stuffed bunny for my little bun-in-the-oven. 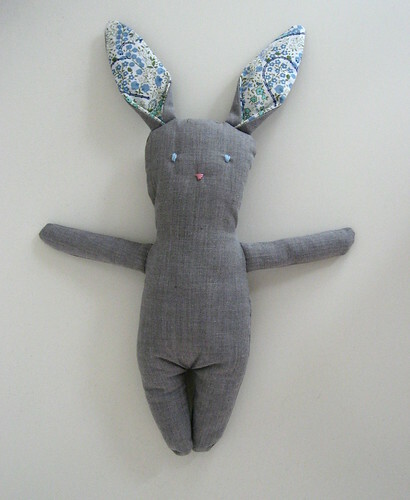 I found this bunny pattern and it looked like what I had in mind and suited my skill level (which would be zero experience making toys). All the materials were things I already had on hand. 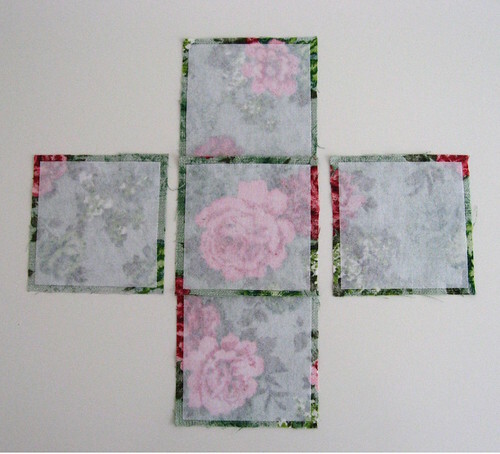 The grey fabric is from the sleeve of a men's thrift store shirt that I used to use as a painting smock. I've named the bunny Oscar for the moment because the shirt was an Oscar de la Renta. Before you get outraged at my cutting up a designer shirt, it wasn't anything fancy ... a 50/50 poly-cotton made in China. The lining of the ears is some fabric I bought here in the Albert Cuyp market. 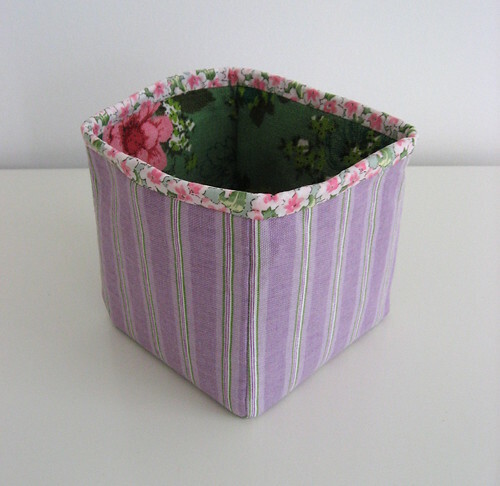 The pattern is pretty simple, though the instructions could use more detail for beginners like me. I wasn't really sure how to attach the arms and definitely had no idea about embroidering features. 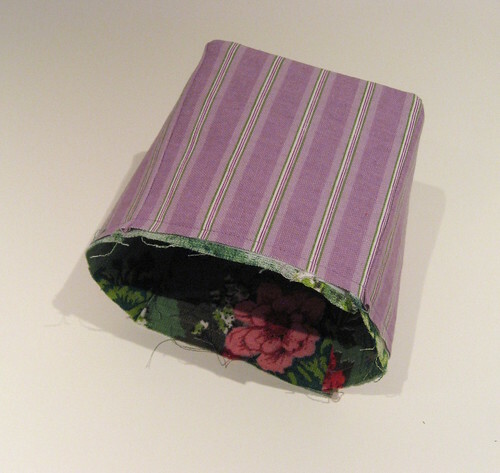 For the arms and closing the seams, I ended up using the ladder stitch that I used to bind my quilt. 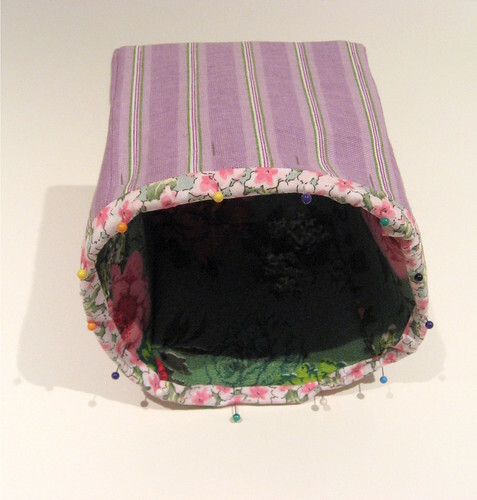 For the features, I used a satin stitch. The one change I made was to add a little filling to the ears before attaching them. I think the legs could have used a wider gap than the pattern gives, because the fabric did end up bunching there, even with the notching. The pattern is split into 4 pages for some bizarre reason. Once I'd taped them together and cut it out, it was clear it would easily fit on a single page, so I have no idea why it's like that. I do this all the time with my knitted toys. But it's one of those things that's easy to show, and hard to explain in writing (and also much easier to do with knitted toys, compared to fabric ones). When you want to embroider an eye, for example, take a long piece of embroidery floss. Go into the head somewhere on the head, and have the needle come out where you need to start embroidering. Pull the floss through until you have an end about 4-5" long where you first went in - leave this, you will do something with it later. Embroider the eye in whatever method you've chosen. After inserting the needle the last time, have it come out at another place on the head, and pull the floss through. Then carefully go back through the hole just made, trying not to catch the fabric, and come out at another spot on the head. Do this a few more times, then trim off whatever floss is left. The bit of floss sticking out should hide inside if you squish the head a bit. Then you can thread the needle onto the bit of floss you left at the beginning, and secure it in the same manner. Running the floss ends several times through the head should anchor them securely, without having to leave a knot on the outside. 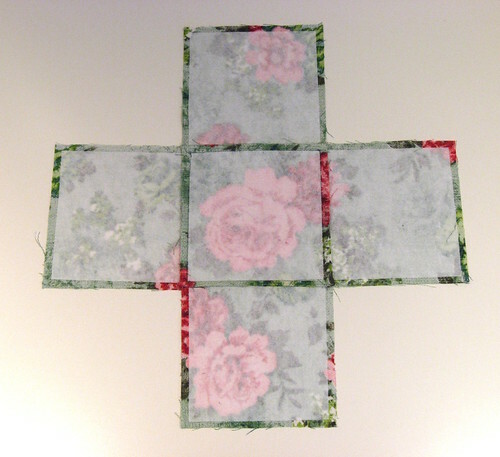 If your floss is dark, and your fabric light, make sure you don't run it too shallow under the fabric, or it will show. 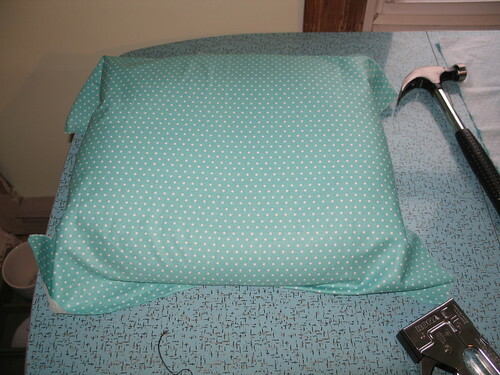 For making something similar in the future, I might try doing the face before closing the side seam. I found that the technique for hiding the embroidery floss did end up bunching the sides of the head a little, and it would be nice to shove a bit more filling in there after finishing that part. In this case, it's part of the charm of a handmade toy and eventually, I'm sure the cuddling (and slobbering) it will get from Bun will even it all out. 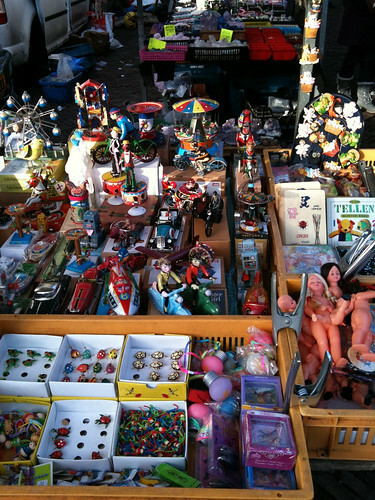 On Monday mornings in Amsterdam, there's a fabric and clothing market called the Lapjesmarkt. It runs along Westerstraat and joins up with the Noordermarkt, where there is a little more fabric, some fleamarket booths, and lots of used clothing. 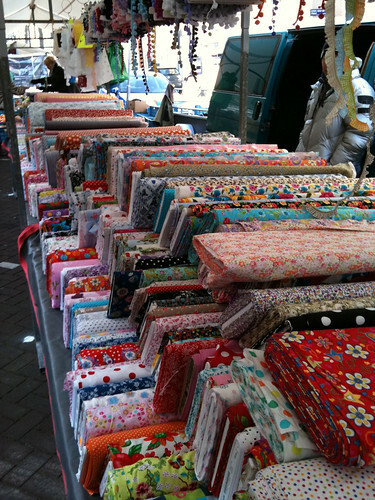 At the Lapjesmarkt, there seems to be just about every type of fabric. I saw suiting, fleece, leather, silky and fancy stuff, upholstery/drapery fabrics, linens, and my favourite booth (pictured above) which was filled with tantalizingly fun cottons. There's also several stalls that sell all sorts of fancy trims. Of course, there did not seem to be anyone selling what I was looking for: flannel. I'll be checking out the fabric stalls and shops in the Albert Cuyp market just in case, but given the array of fabric at the Lapjesmarkt, I'm doubtful whether I'll find any. 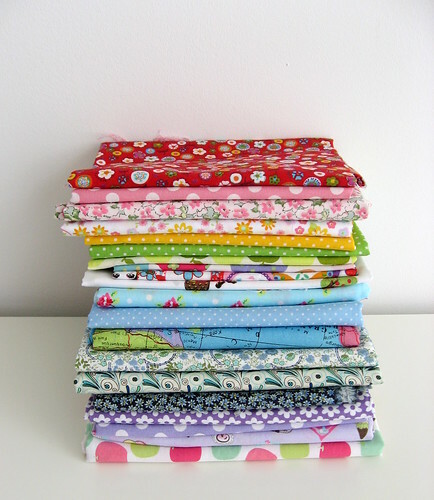 If anyone knows where to find cute flannel prints (for making cozy baby stuff) in Amsterdam, let me know!